Are you thinking about selling your home? Or maybe you’ve decided to sell your luxury apartments in San Francisco? Or better yet, maybe you haven’t decided to sell anything, but as a homeowner you’d like to do whatever it takes to increase the value of your property. No matter which situation seems right to you, just know that it’s possible to take advantage of some quick, inexpensive fixes that could add thousands of dollars in value to your property when it’s time to sell. By making these changes, you will not only improve your odds of selling the property, but you’ll also improve your way of life, because your home is going to be much nicer, more attractive, and maybe even more functional. With that said, we’ll now take a look at some powerful tips that you can use to boost the value of your home. When you’re through, you’ll love the way your home looks, feels, and you’ll be incredibly proud of the changes you’ve made to your living space. Many people look at their energy bills every month and think of them as a relatively fixed expense, when nothing could be further from the truth. It’s quite possible to take steps that will definitely help lower your energy costs. How do you accomplish this? Well, you can contact your local energy provider and ask them to perform an audit on your behalf. When they do, they will tell you areas where you seem to be wasting energy and you can change personal habits or fix things that will eventually help lower the costs and amount of energy you use. As an example, one way to lower your energy bills is to get rid of old, outdated, energy sucking appliances and use energy-efficient options. Always choose appliances with the Energy Star rating to make sure you’re using the best, most efficient ones that money can buy. Some other areas to check include discovering and sealing air conditioning, heating, and ventilation ducts; further insulate light switches and outlets, insulate your hot water pipes and water heater, install double pane windows, upgrade the insulation in your home, and reduce heating costs in the summer by planting trees outside of your house to deter direct sunlight. As you can see, this is just a few of the most effective ways to cut down on your energy costs. You can also lower your energy consumption as well, and this is another way to lower your energy bills without having to spend money to upgrade your home. 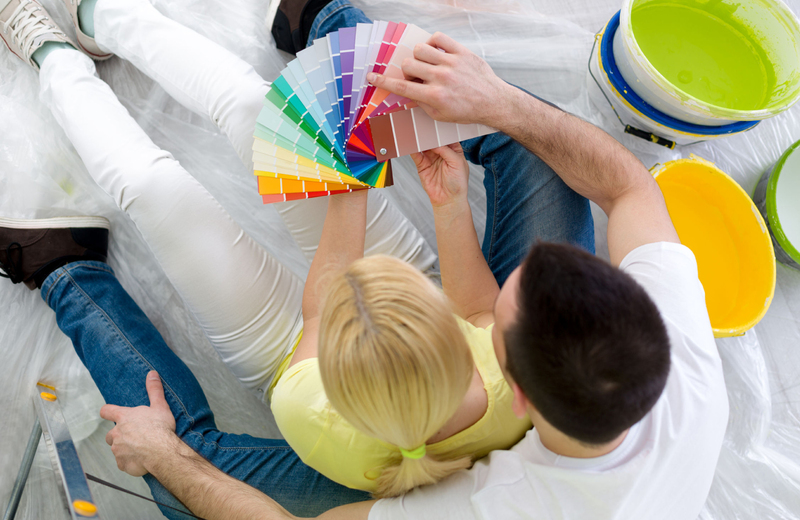 For some reason, people fail to realize the value in adding a fresh coat of paint to their luxury apartment or home. You’ve been living in your house for so long that you hardly realize your paint is old, dirty, fading, and it no longer has a lustrous and attractive look. But if you put a new coat of paint on the walls and ceilings, you’ll suddenly see that your house or apartment is much brighter, lighter, and way more attractive. Guess what? When you update your paint the rooms begin to look cleaner and a whole lot nicer. If you’re willing to paint yourself, the only thing you’ll need are supplies like $25 gallons of paint, brushes, rollers, painters tape, drop cloths, etc. and a willingness to put in the time needed to get the job done. You can pick up low-cost paint supplies from places like Home Depot, Lowe’s, Sherwin-Williams, or your favorite local hardware store. If property appraisers or potential buyers come to your home for the first time and see a worn out, burnt up, patchy lawn with overgrown grass and outsized bushes, your home is going to stand out, but definitely not in a good way. By leaving your yard in this condition, people will immediately get turned off and it’s certainly going to hurt the value of your property. So, this is an easy fix whether you know it or not. And if you do not have the time to work on your landscape yourself, don’t worry because there are plenty of professional lawn services and landscaping companies in your community that will happily do the job for a low price. On average, you may have to spend anywhere from $500-$1000 in order to make your lawn look crisp, clean, and pristine once again. But it’s definitely a worthy investment because your home is going to look attractive because the landscape looks attractive. Your lush lawn and neatly trimmed hedges are going to be the talk of the town and believe us when we tell you; potential buyers are definitely going to notice your luscious lawn and gorgeous plants and flowers. Again, you can perform landscaping duties yourself and pick up supplies in person or online from Home Depot, Landscape Supply Co., Gardeners.com, Lowe’s, or local hardware stores and supply companies in your community. Or you can hire expert landscape designers in your community to ensure your yard looks beautiful. The choice is yours so we’ll leave it up to you. When it comes to buying luxury apartments in the San Francisco bay area, there are no better options available than those in Vintage in Pleasanton, CA. We absolutely love this amazing luxury apartment setting because these distinctive apartments are not only gorgeous, but they also have great amenities in a fantastic neighborhood. Clearly, these apartments are waiting for anybody who desires to live in style and luxury. If this sounds like you, then you should seriously consider checking out Vintage and discover more of what it’s all about.